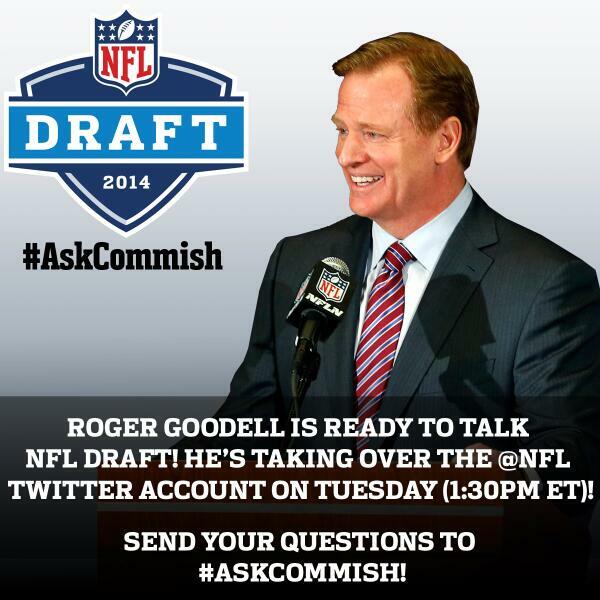 The NFL encouraged its fans to ask Commissioner Goodell questions using the hashtag #AskCommish. And things quickly got out of hand. The NFL decided to let fans ask Commissioner Goodell some questions about the NFL draft, which takes place this weekend.
.@nflcommish is taking over @nfl on Tuesday (1:30pm ET)! However, it quickly became evident that Twitter users had a lot to say about the commissioner's handling of the league beyond the draft. Even Nevada Senator Harry Reid took the opportunity to question the commissioner. And things got a bit personal. #AskCommish Any plan of punishment for Jim Irsay or does his money mean that much to you? Some questions were slightly more on topic. #AskCommish do we still need blackouts for games? #AskCommish Do you think Joe Flacco is elite? #AskCommish is there a possibility for new teams anytime soon? #AskCommish If someone got in trouble in Philadelphia, and later moved to live with his aunt and uncle, could he still play in the NFL? But most were super random. #AskCommish Is a hot dog a sandwich? #AskCommish do you think the movie did an adequate job of conveying the emotions related to Dumbledore&#39;s funeral? #AskCommish do you think the movie did an adequate job of conveying the emotions related to Dumbledore's funeral? The commissioner was understandably careful with his choices. "@ThomasMejia79: When you were a kid, who has your favorite football player? #AskCommish"
"@RealSlimGrady93: Would you rather fight 1 horse-sized duck OR 100 duck-sized horses? #askcommish"
Though he did let on that he was seeing the serious questions. &ldquo;@JerryVerHaagh can I be commish for a day?&rdquo; From seeing some of these #AskCommish tweets, you sure you want to?? #AskCommish why did you think this was a going to be a good idea?